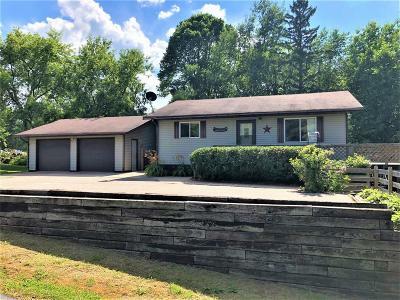 Take a look at this beautiful home in a GREAT location near downtown Phillips on Long Lake, part of the Phillips Chain of Lakes! You&apos;ll enjoy recreation at its finest -- fishing, swimming, and boating right off your dock, ATVing out your back door, and snowmobiling nearby! And for entertainment, Harbor View is just a stone&apos;s throw away! This home offers an ideal layout w/ main floor spacious bedroom, full bath, whirlpool tub, and open concept kitchen/living area with beautiful panoramic lake views and patio doors that lead out to the lake-side wrap around deck. The lower level offers a kitchenette, bedroom, full bath, laundry, and a large family room with lake views and a walkout to the lake. This home has the potential to be renovated into a duplex and could be operated as a lake front retreat and/or investment property! There&apos;s a detached 2-car garage with a workshop/additional storage. Call today to set your own personal tour and make this yours to enjoy this summer!